So I took the recipe I modified from C1 and tried it out. C1 only had 7 grams of Citra with 5 minutes left in the boil. With C2 I added a 14 grams of Citra at flameout. Otherwise everything was the s ame Maris Otter, Crystal Malt 80 and Special B. A lot of the picture show more of the later stages of this brew process because I was trying a closed system for cooling the wart. 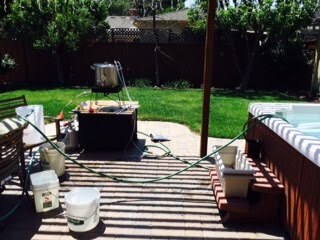 I borrowed my fathers submersion pump and put it in a bucket on the ground which pumped cool water into the wort chiller. 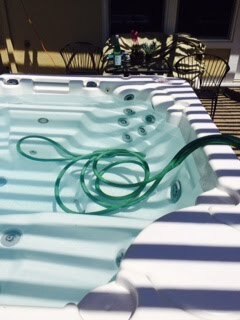 The return from the chiller went through a garden hose that ran through the hottub, i figured I might as well use the 70F water to my advantage as every bit of cooling helps. 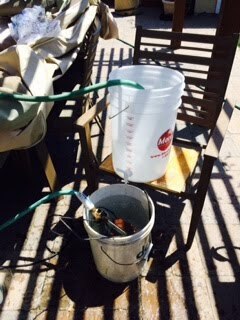 The garden hose then went into my bottling bucket full of ice with it's pour spout open above the submersion pump bucket. Everything went will until I was about 80F and the pump turned off. I ran off the faucet the rest of the way and was fine. I was never able to get the pump back on. It didn't overheat, but something must have jammed it. Months later my father tried the pump again and it turned on, so he took it apart and saw the pump oil was only a 1/4 full. It is a very old pump, so it took a while to find the oil, but after he did he filled it up and it works without problem. Back to the beer. My brew process went well this time. I didn't forget anything during the process. This batch I got a bigger boil, unlike the steady low boil I had with C1. As a consequence, the beer was volume was lower and the original gravity was 2 points higher than expected. Tasting the wort I felt it was better than C1, so I was anxious to see how it turned out. When I calculated how much wort there was and added the extra evaporated water into BeerTools, the gravity came back into line. I kegged this beer as we were having a late May hottub party. My friend brought his gear to serve his Wheat EPA and my C2. The C2 didn't disappoint. Everyone like it and kept going back to that tap. I was pleased with the flavor, it had a bit of that maltiness from the Maris Otter with a gentle Citra note. My friend would ways say it's a good American Pale Ale and that I was off-style by saying it was an EPA. I didn't mind and I wasn't too concerned with names. I brought it to our Worts of Wisdom brew club meeting and people there like too, so it was good to see peers giving it a nod. I got a comment about style again which was fine.